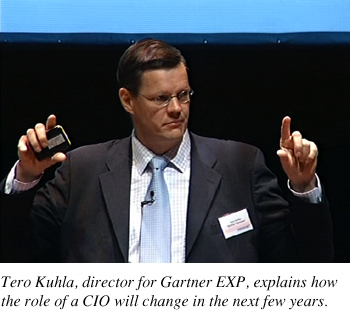 The first keynote speaker at the conference was Tero Kulho from the Gartner company. He talked about Gartner�s views insofar as the changing role of an organisation�s CIO are concerned, also addressing how IT has an effect on any organisation. Kulho argued that an lack of true leadership on the part of IT will degrade corporate performance. If the CIO and IT are not integrated into the development of business strategy, that has a significant impact on the ability of the relevant enterprise to achieve its financial goals and to achieve full competitive advantages. IT leaders, said Kulho, cannot contribute toward a business strategy if they are not fully engaged as business leaders. This requires managing IT like a business, as well as thinking and acting like a business leader by moving outside the framework of IT alone so as to help in encouraging innovation and better corporate performance. Kuhlo said that IT organisations might be expected to fully participate in these processes sometime around the year 2012. We�ll see whether that�s true. A module called �Scientific Visions� was addressed by Dr Aleksandr V�ljam�e from the Chalmers University of Technology and Leo M�tus from the Estonian Academy of Sciences. Both men talked about the latest technologies. V�ljam�e said that humans distinguish images as if in a film if the images change according to the rhythm of sound. If the rhythm speeds up while the pictures remain unchanged, people will compile more predictable images in their own minds. He presented the example of a rabbit which seems to leap forward at a successively more rapid speed, while in fact this impression is only caused by a sound effect, with the rabbit jumping at the same rate of speed on screen. M�tus spoke about ubiquitous computing systems, embedded real-time systems, vitiation of basic ICT theories in certain applications, etc. He also presented a review of research that has been done in such areas as autonomic agents, multi-agent systems, occurring behaviours and dynamic changes related to structure and functionality. He described this as a serious of new theories and derived methods for the development of technologies � methods that are better than existing ones. In a module called �Globalisation Vision�, IT specialist Nikolay Royenko from Ukraine talked about the ICT sector and related business opportunities in his country. Andrus Viirg from Enterprise Estonia talked about his job of developing business relations in Silicon Valley in the United States. Eero Holstila, director for economic development in Helsinki, talked about how his city is emerging as a word-class example of an innovation ecosystem. Holstila said that the infrastructure and technological environment which exists in the Helsinki-Tallinn region is interesting to many investors and innovators, so greater co-operation between Finnish and Estonian IT people can be expected. After a coffee break, Kuba Karlinski from INNOVATICA talked about driving engines for innovation. Without being aware of all of the unmet needs of customers, companies devise solutions which they then test with those consumers. The solution-first approach means that it is only by chance that an optimal solution can be discovered, said Karlinski. The last speaker was John Strand, CEO of Strand Consult. He described mega-trends in the telecommunications industry, predicting that there will be massive movement from traditional telephony to VoIP and TV over IP. Video on demand will be an enormous business, and bespoke services will lead customers to make that choice. Strand said that one can create one�s own Mobile Virtual Network Operator in just 10 minutes� time (at least in the United States). One only has to choose a brand, create content, invite friends to join, and earn money from the content which those friends consume. An interesting presentation was made by Peter Pfl�ging, ICT development manager for the Austrian capital city of Vienna. He talked about the management of ICT systems that are almost entirely based on freeware solutions. Vienna, he said, has more than 35,000 civil servants, but only 470 of them work in the IT Department. Agu Leinfeld from Estonia�s Citizenship and Migration Board talked about the development of solutions in the area of personal identification. As manager of the board�s ICT Department, Leinfeld demonstrated how easy it is to ascertain a person�s identity from a photo, as well as to determine whether the individual is an Estonian resident or citizen. In the near future there will be no need to equip oneself with a passport or ID card in communications with civil servants. Identification instead will be a biometric process. Other presentations were made by Claus-Peter Unterberger, vice president for marketing in EMEA for Oracle, who spoke about a virtualised world in Europe; Ingvar Kupinski, Private Client Services Department manager for Elion, who addressed the future of Internet TV, Kalle Immato, marketing manager for Lotus in the Baltic States, and Andrew Cleverly, chief technology officer in EMEA for Oracle, who spoke about practical solutions � Immato about IBM Lotus and Cleverly about the new 11g database solution that is offered by Oracle. A session on security featured Estonian Defence Minister Jaak Aaviksoo along with Rain Ottis, director of the Cyber-Defence Department for Estonia�s defence forces. Aaviksoo said that it is worth supporting the establishment of a new cyber-defence union, which would be quasi-military but made up of volunteers who wish to participate in the activities. Ottis described the history of the cyber-war in which Estonia found itself engaged in April and May 2007. LESS TECHNOLOGY, MORE FREE TIME! 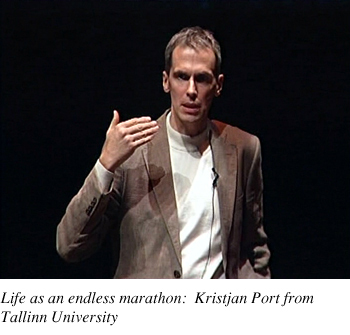 The final address, �Changing the World Starts with Changing Yourself�, was delivered by Kristjan Port from Tallinn University, who is also a board member at Curonia Research. Port said that people are working more than ever before, but also wasting more time than has ever been the case in the past. The increasing tempo of everyday life and the expanding range of activities in which people engage are the result of direct access to information and to other people. Many technological innovations promise more effectiveness, greater freedom of choice in terms of the form which work takes, fewer mistakes, less stress, etc. At the end of the day, however, reality is quite different. There is no free time, people work when they are supposedly on holiday, and work finds us absolutely anywhere � even when we are in the loo. The next conference � the 10th � will take place in 2008. One hopes that it will be a grand event once again.